We’re grateful to have been chosen to benefit from a People’s Postcode Lottery draw this month, with the proceeds totalling £1,027,744.64. 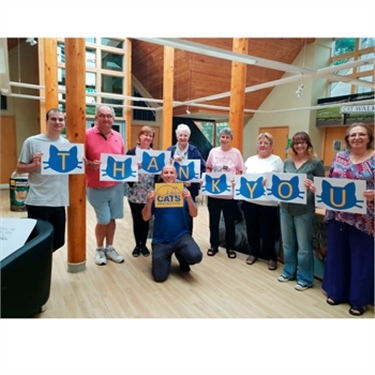 The money will go towards supporting the charity’s rehoming and volunteering work, funding hands-on roles that directly benefit the cats including Cat Care Assistants and Volunteer Team Leaders throughout England, Scotland and Wales. Volunteer Team Leaders support volunteers to provide the best possible cat and adopter experience at the charity’s adoption centres, while Cat Care Assistants are responsible for day-to-day hands-on care for the cats – from feeding and providing enrichment for the cats to administering medication. Joel Scott is a Volunteer Team Leader for Cats Protection’s National Cat Adoption Centre and Eastbourne Adoption Centre and feels positive for the new partnership. “It’s great that volunteering and rehoming is going to be generously supported in this way” he said. A minimum 32% of the £10 monthly ticket price goes directly to charities. Players of People’s Postcode Lottery have raised £340 million for 4,000 good causes across Great Britain and internationally. You can find out more about our work with the People’s Postcode Lottery here.